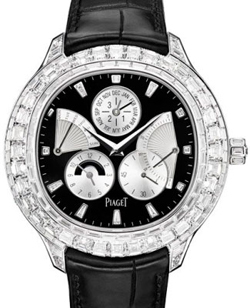 Fine jewelry from Piaget Emperador watch.Gorgeous jewelry and watch brand Piaget are very popular all over the world. In hours Emperador Perpetual Calendar cushion case decorated 560 diamonds weighing 15.3 carats. To decorate the body, jewelers worked more than 100 hours. Dial novelty Emperador Perpetual Calendar is made of black pearl, on which there are counters and indicators in the form of a fan. The magnificent clock, which complements the black leather strap, equipped with an ultra-thin caliber 856P with perpetual calendar and retrograde date display and day. Another model – Emperador Tourbillon has a case of the same shape as the clock Emperador Perpetual Calendar. It is decorated with diamonds weighing 18.4 carats, shine that will not leave anyone indifferent. Compared with the previous novelty, the Emperador Tourbillon watch no face, instead of which is skeletonirovanny tourbillon caliber with delightful. Thickness gauge – 5.55 mm. All the beauty of the automatic mechanism 1270P, which is equipped with a model Emperador Tourbillon, visible through sapphire glass on both the front side and on the back of the watch.